Somebody once said a boat owner is just somebody who has more money than common sense. There just might be some truthful wisdom in that. Visual Evidence of Common Sense Disorder? Thus here we are a month following our last post – having moved out of the condo and back onto Ghost Rider – and we are still trying to resolve the overheating stuffing box issue. 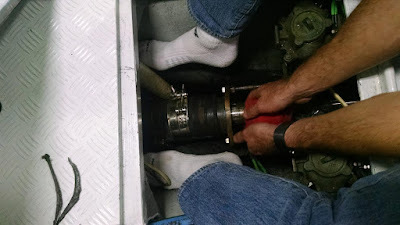 Actually that situation had worsened….on our last sea trial (after yet another repacking) not only did the main engine shaft’s stuffing box get overly warm, but the wing engine’s unit was absolutely cooking. We could have baked bread on its small shaft. We had barely made it to the first bridge down-river when we had to turn around and limp back home. 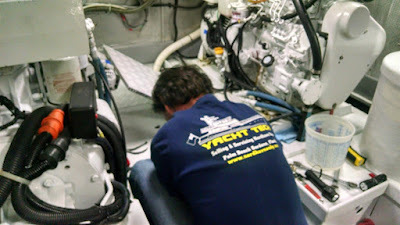 Rick once again spent more hours in the engine room while we were underway trying to adjust tension and water flow – while also running a stream of cooling water from a garden hose on the shafts – but to no avail. 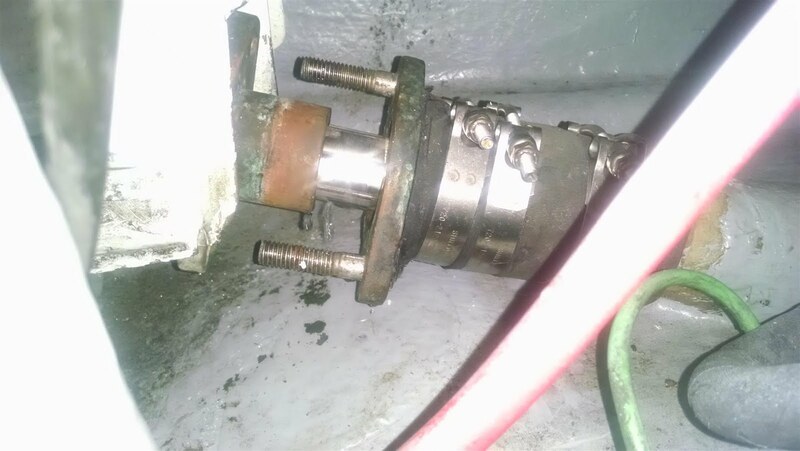 So we once again pulled apart the main engine’s stuffing box, removing the follower collar completely, and first assessed water flow. While we saw decent volume it was uneven….not enough flow on the top of the shaft unless we raised the level of the shaft with some manual muscle power. 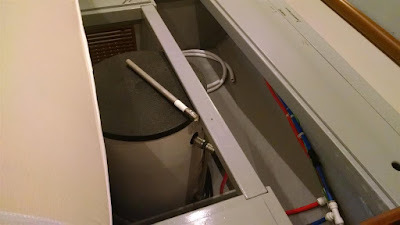 So that led us to another realignment attempt, removing the clamps that held the shaft hose in place and rotating the entire mechanism until we got even water flow around the entire shaft. We then torqued everything back down, satisfied that we had minimal friction and a symmetrical flow of sea water around the entire shaft circumference. And, thankfully, once again our bilge pumps kept up with the sea water influx. After that we attacked the wing engine’s stuffing box. The level of difficulty there is significantly higher as the working area space is severely constricted to just a few inches of clearance between the wing engine’s transmission and the floor pan. 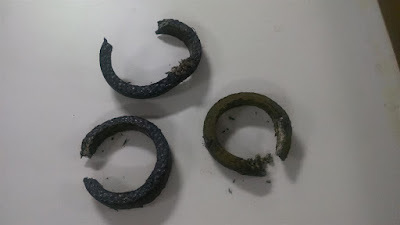 But eventually we were able to remove its follower collar and remove the old packing rings – which looked pretty gnarly and felt just about petrified (from overheating, no doubt. Rick was willing to bet they were the original packing rings from 15 years ago.) Unfortunately, even with all that removed we weren’t getting very good sea water flow. So we double-tied our dock lines, put the wing engine in gear and then applied throttle. That eventually forced an acceptable rate of water flow (and expelled years of unidentifiable crap from the shaft tube). Fortunately we didn’t rip out any of the dock cleats or ram the dock in the process. We installed two new rings of 5/16” packing rings, but kept the follower collar fairly loose to let those PTFE rings settle in while keeping water flowing in the shaft tube. At this point, however, a combination of a full / super moon, along with an extreme low point in the tide cycle and a brisk north wind, was providing us only a few inches of water under the keel….so while we would not have sank very far if the bilge pump(s) had failed to keep up, we couldn’t sortie out yet for a good sea trial. The tide / moon and wind conditions should improve after a few days, and we’ll be anxious to get out of the marina to exercise and adjust both stuffing boxes – we’ve learned from experience those are not one time “set and forget” items. In addition to all of that shaft and stuffing box fun, we’ve also continued to address other routine maintenance and remediation items, learning more about Ghost Rider and her various systems nearly every day. → Rick replaced our Aigean WiFi AN-7000 booster with a new and upgraded version of the same thing; it was a volunteered freebie from the manufacturer, can’t beat that kind of service. → We had some LPG troubleshooting to pursue after the gas range started having intermittent issues; turns out one of the previous owners had relocated the galley control panel to a new location, but one that lacked enough clearance for the switch wires, resulting in bent terminals and odd behaviors. 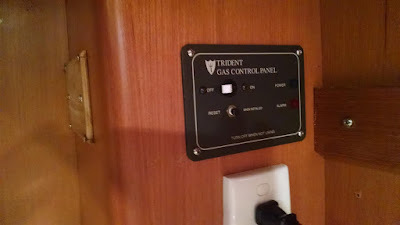 Rick was able to repair and relocate the panel and the stove is once again tactical. → Our Wheelhouse maintenance program reminded us that it was time to have our Winslow life raft serviced and repacked; that’s recommended at 3 year intervals. Fortunately Winslow has a full service center nearby so we were able to drop it off vs. having to ship 55 pounds of bulky raft packing back and forth. 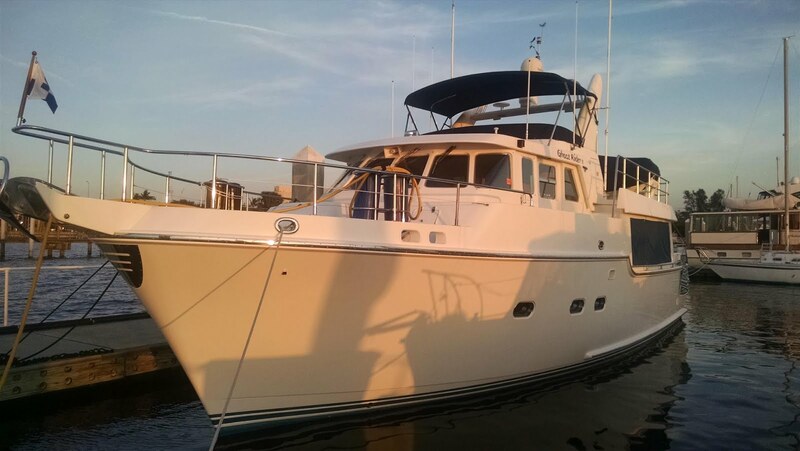 → Wheelhouse also was nagging us that our dinghy’s Yamaha outboard was due for its annual servicing. It’s nearly impossible to get a qualified Yammer tech to come out to a marina to work on a small outboard anymore, so Rick decided to tackle the job himself. It took nearly a full day but the oil and filter change, lower unit oil change, two fuel filter replacements, anode replacements and new spark plugs all got accomplished without too much drama and only a minor mess. → During our latest monthly bottom cleaning the diver noted that both prop shaft collar zinc anodes needed to be replaced, resulting in a bit of a scramble to find the correct sizes; that took some sleuthing as the boat’s manual isn’t very good on specifying those particular part numbers, but we finally got it done. Engine Room with Red Fire Bottle on the Right...It's 32" Tall and 7"
Room a Suddenly Quiet Place. 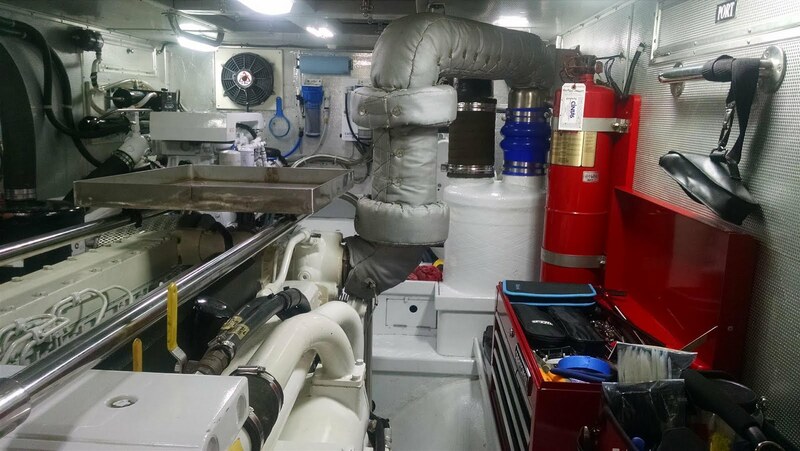 → Yet another Wheelhouse maintenance reminder told us it was time for the annual test of the Fireboy fire suppression system. This was an interesting exercise: first you start all three diesel engines and energize all engine room ventilation fans; then you disconnect the lead wire at the engine room and lazarette fire bottles (separately) and verify that the engines and fans shut down (they do); then you place the fire suppression toggle switch to its “override” position and verify that you can restart the engines (we could). It’s a pretty slick safety system and we were pretty happy that none of that experimentation resulted in a fire bottle discharge. Berth. That Big Rod is the Magnesium Anode that Needs to be Installed. The other – and nearly perpetual – set of activities that continues is provisioning….Michelle has been stocking the boat with all manner of food and beverage, and apparently in sufficient quantities to make the boat list quite a bit to port. Rick is trying to offset and balance that with the appropriate spares and pales of oil plus some fuel transfers, but so far is losing that battle. Very nice update but a lot over my head, but I enjoy reading it since someone else is doing it. ha Hope to see you'll in 2 days at the Annual Dinner. Nothing you couldn’t handle…it’s just new jargon. See you Saturday night! 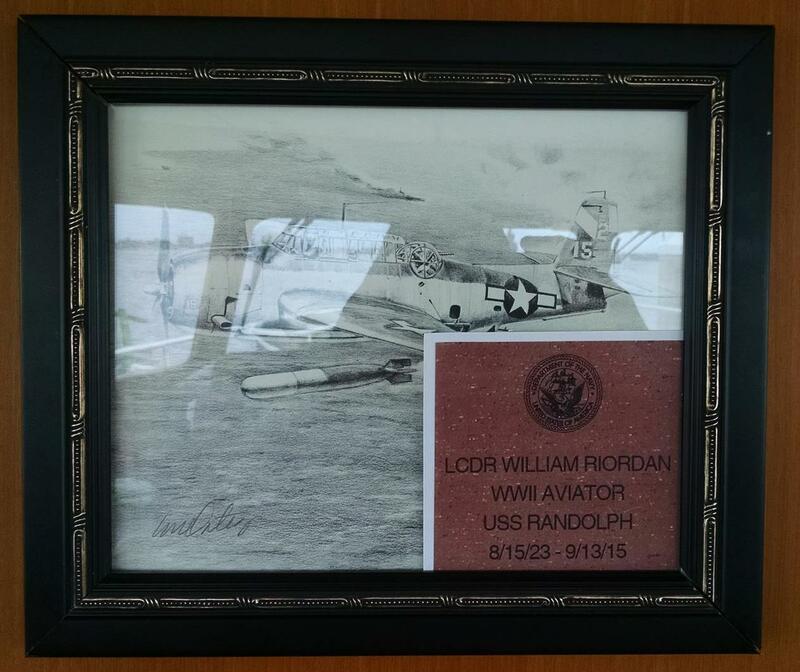 All boats and boat owners go thru 'phases' :-) The TBM was my Dad's first combat aircraft in WWII. You had to be mostly nuts to fly one of those.